Urban farm pressure. 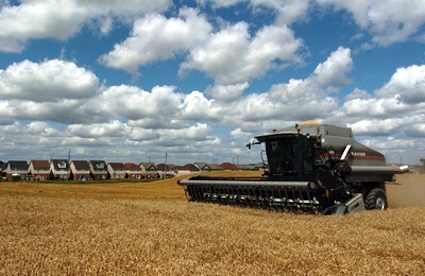 A combine harvests wheat off Fischer-Hallman Road in Kitchener. As Kitchener’s suburbs have grown outward, the once-quiet countryside has become a busy suburb. Photo by David Bebee. Flourishing cities are good for a lot of things. But when you’re a farmer, growing food in the urban shadow can also be a real pain in the neck. Waterloo Region is home to about 1,400 farms, and the roughly $400-million sector still employs about 3,500 people directly. But as our population swells past 550,000 residents, some farmers are feeling increasingly out of place on land their families have farmed for decades. And no wonder — Waterloo Region has lost about 32,375 hectares (80,000 acres) of working farmland since the 1920s, according to Statistics Canada. It hasn’t all gone to urban sprawl, but much of it has. In the 1950s, the region’s built-up urban areas totalled 38 square kilometres. Today, they’ve swollen to over 202 square km, according to a study by the University of Waterloo’s map library. Many farmers who own land near this region’s urban areas have had experiences similar to Henhoeffer’s. People trespass through their fields and tear up their land joyriding.